Years that add up to #5 are represented by the Hierophant. This year you will likely feel more grounded and firm in your spiritual convictions than usual. You might find that people are looking to you more often to help them with their important decisions. Questions of morality are likely to be particularly interesting to you. Family, tradition and practicality are highlighted with the Hierophant energy, as is a highly attuned sense of the divine. Try not to take things too seriously though, not everything has to be heavy. Sometimes fun is as necessary as getting down to business. 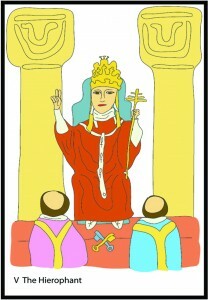 The shadow symbol for the Hierophant is Temperance.